Ok. So I am not sure if I completely enjoyed One Trick Pony or not. On one hand, the narrative and visuals feel compact on the page and so busy and dense with narrative jumps that I didn’t get a chance to breathe. On the other hand, there’s something interesting in this world-building that Nathan Hale (he, of the fantastic Nathan Hale’s Hazardous Tales series) has created here. The story revolves around a world (ours? Earth? our Earth?) where aliens are devouring all of the technology and metals, and the scattered tribes of people left on the planet are on the run from strange creatures doing the devouring. These creature are called Pipers, and there is some hints of The Pied Piper story that doesn’t ever really develop further. Three youths, out on a secret expedition from their caravan community, discover a hidden trove of robots, including a golden robot pony (the “one trick pony”) that helps them to escape and then, sacrifices its life to save Strata, a young girl who adopts the horse and rides it, and the entire world. The pony becomes a hero. What I write here is not a bad review. The book is intriguing. But I guess I prefer more space in stories, more room on the page, more quiet in the corners of my books. 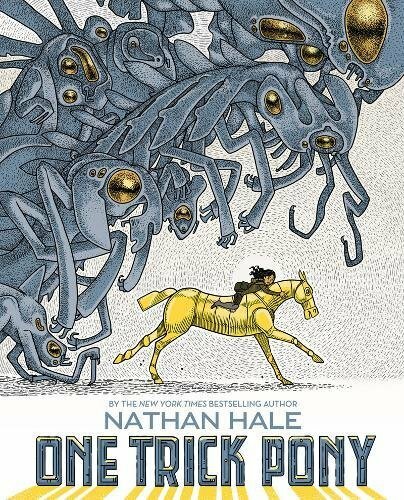 One Trick Pony is brimming with lines and shapes and words, and three or four different converging stories and characters, and Hale’s intricate drawings propel it all forward. I think this graphic novel could be appealing to upper middle school and high school readers. Younger readers might find the story confusing, although they might be drawn in by the pony. Because … well… ponies.